The Beatles sang, “I get high with a little help from my friends.” Too many puppies (and the odd obese Chinese toddler) can sing a similar refrain about their weight. 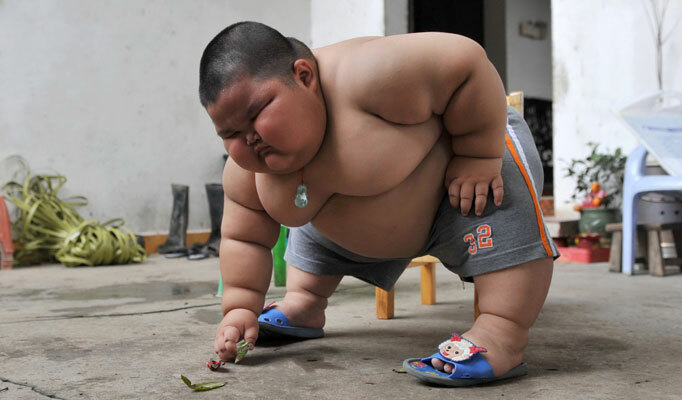 Or parents, in the case of Lu Hao, the very young Dashan (Guangdong Province) resident who’s already crested the 140 lbs. threshold before his 4th birthday. Whether we’re talking about puppies or chubby Chinese kids, dog owners/parents need to take responsibility for their charges’ weights. Neither the kids nor the dogs are buying the groceries, cooking the meals, distributing the entrees, or handing out the treats. They’re not finding calories in a stash of Hallowe’en candy hidden in a closet, either. True, the dogs (and the multiple-bowls-of-rice-eating Hao) are the ones chewing and swallowing but the stuff going into their mouths is cooked/prepared/delivered by someone who should know better. Our nation’s puppies and pooches are growing almost as fast as the national debt. 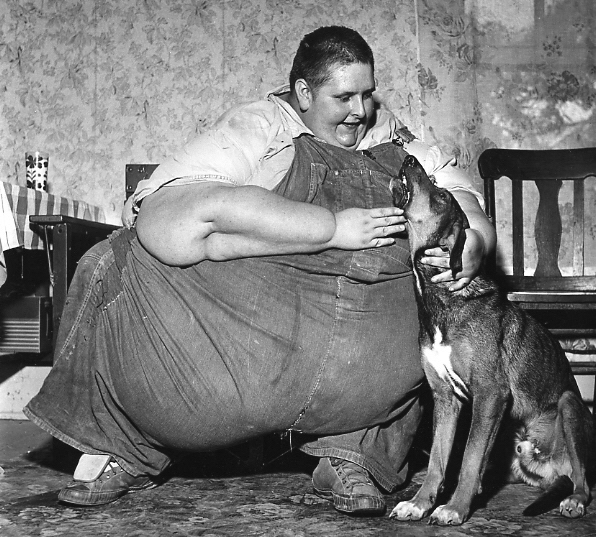 Having already lamented that a troubling number of dog owners are chubby, why are more than half the dogs in America overweight or obese, too? In its fourth annual study of obesity and dogs, the Association for Pet Obesity Prevention (APOP) found that more than 55% of dogs were overweight or obese. (NOTE: honk if you think that the fact that there’s even an organization called the Association for Pet Obesity Prevention is troubling). Among the sample of 383 dogs, 35% were overweight and 20.6% were obese. OK, it’s a pretty small sample as statistical studies go but still….they found a lot of dogs that could use a little exercise at cool places to walk dogs. without a negligent owner, do you really think I would be this fat? The risk is the same as it is for the huge people who intermittently appear in grainy black and white photos (see below) on the covers of supermarket tabloids. 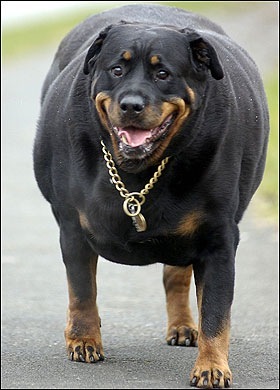 Excess pounds are as detrimental to a dog as they are to humans. Weight-related ailments that can afflict dogs include arthritis, diabetes, high blood pressure and kidney disease. Oh wait, they haven’t included exercise or dog walking in the box. So it is really only foolproof if you combine the calorie control with some exercise. But then you could have done this yourself without paying a surcharge for Hills to fill the box with prepacked, premeasured food and treats, and a lot of small plastic bags to throw away in the garbage once opened. It is the dog owner version of buying 100 calorie chocolate bars or cookies. Everything in moderation except commonsense. And without commonsense, you can wake up one day to find out that your lovely Rottweiler has inflated and now looks like the Barnyard movie’s Biggie Cheese character, an enormous rat who raps. The bottom line if I still haven’t convinced you to get serious about weight loss for your pet is this: the reason you don’t see really old, really overweight humans is the same reason you don’t see fat, old dogs. Fat bodies die young. This guy died at 32.
one dog that beat the odds. his owner died young, of course.